Diwali is round the corner and its time to enjoy the savory snacks that makes perfect combo with delicious sweets...!!! 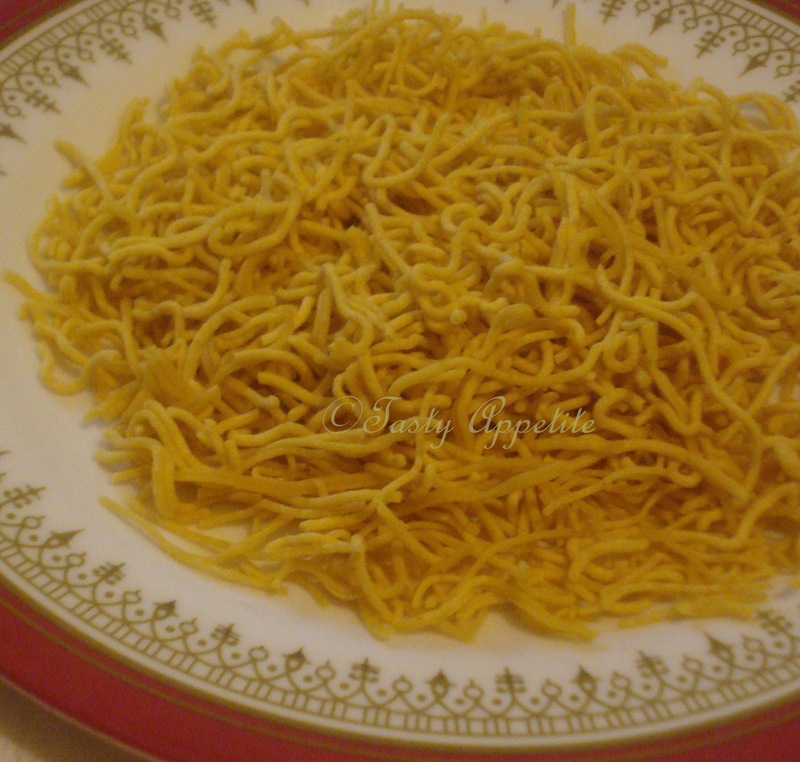 Oma Podi / Sev is a savory recipe, which is quick to make at home with rich aroma of Ajwain. Also, chaats would be incomplete without these crispy Snack sprinkled on it. Here is a simple step by step to prepare this Sev at home...! 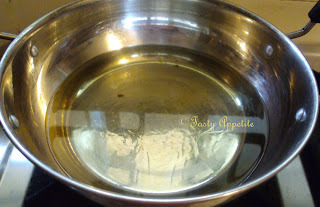 Soak Omam in water for 1 ½ hours. Boil it with water to get Omam water. Allow the water to cool. Now filter the water and keep it aside for mixing the dough. In a wide vessel, take gram flour and salt. Add the Omam water and knead to soft dough. Make equal portions of the dough. 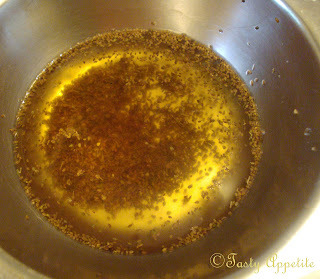 Grease a Sev / Oma podi press with oil. 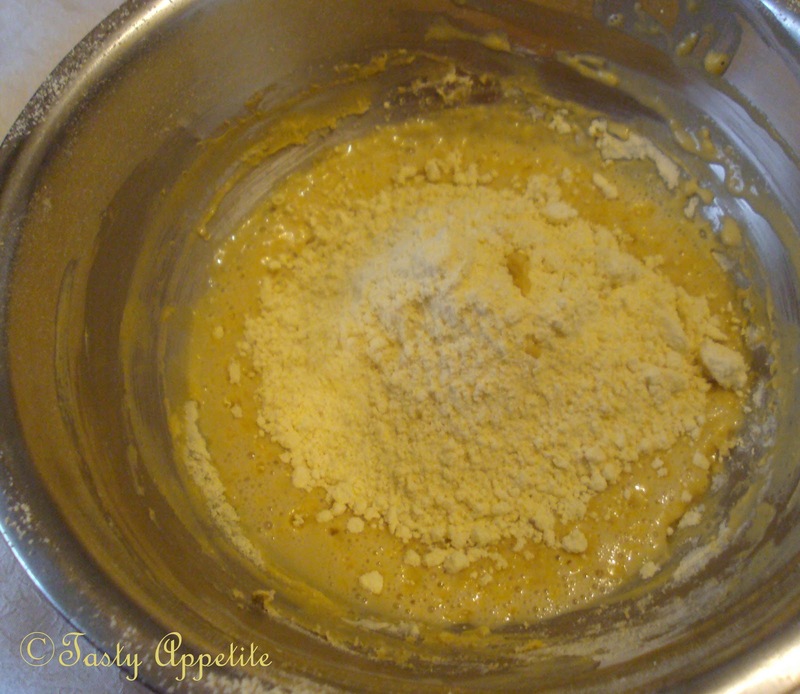 Fill in some dough and press directly in hot oil in concentric circles. Wait and allow to cook. Flip gently to other side. Deep fry till nice and golden yellow color comes. Take it aside. And drain in kitchen tissue. Give a gentle press and make small pieces. Hi, this looks good. Thanks for sharing the step by step method. *hugs* Have a nice days. Wow1,neatly done step by step recipe of Ajwain Sev.Luv it Jay. so crispy and nice munching snack !! 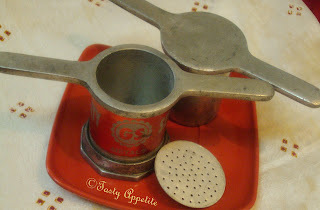 What a fun noodle press! Jay, till now i think making omma podi is a tough job,after ur post only i know how quite simple it is..,thanks for sharing with us. I always love home made oma podi...yours look superb. this looks so yummy! nice clicks! You brought the festive mood by posting the savory. Thanks for sharing. Happy Deepavali. I love this snack, no I have the idea to make it but I dont have that tool to make that shape any other suggestion? I have been postponing this for a awhile now. Looks perfect. Thanks for your wonderful feedback..
Ciao Jay! Nice to meet you :) Your blog is full of beautiful Indian recipe...here in Italy we have the same recipes in each book or restaurant, adapted for the italian taste... yours look more genuine and interesting! Thanks for sharing! wow! looks so perfect, crispy and crunchy. perfectly done. Your post is amazing and full of knowledge. I was finding this type of information from long time and I got all things from this blog everything is defined by great thought. I think you should continue do this type of blog. i loved this!!! it looks so crunchy!!! What a coincident Jay, just prepared the dough to make this, nice and crispy outcome. perfect n crispy oma podi!! This recipe looks very easy.. It has come out super crunchy.. will definitely try this out for diwali. Wow! The oma podi looks quite delicious and yummy! jay looks just to great with chai..
What a fun snack...I love crunchy treats! Have a wonderful week, Jay! 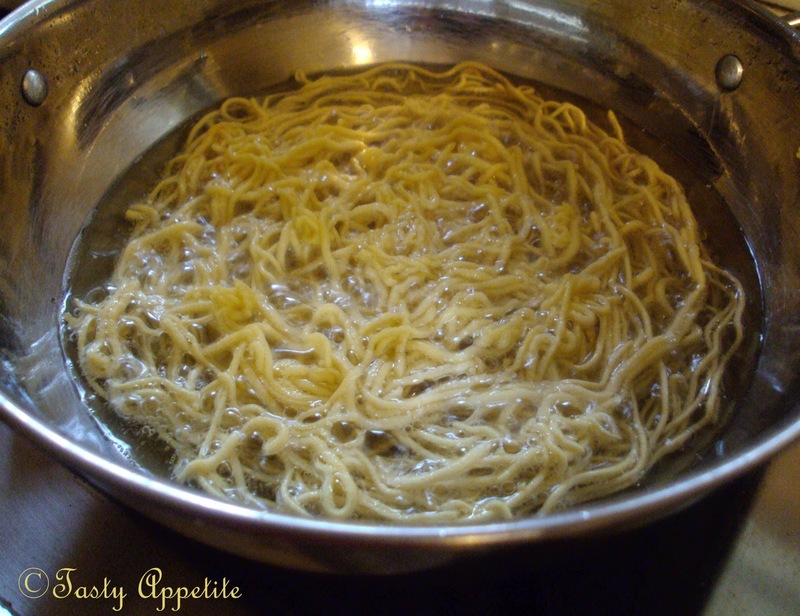 I really like these chickpeas pastas! hi jay, what is omam or bishop weed, next time, if you do a recipe with omam, please post a big photo ok..
i am learning a lot of new words :) thanks. 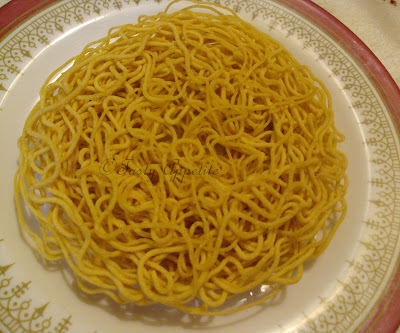 over here, looking at your photo, i think we call it muruku..wonder if it is the same as oma podi. i like muruku very much..
My fav crispy ompodis, i can have it anytime..
and tq for sharing this recipe, I'm sure my sons will like this snack! Oooo..i can almost taste the crispiness. Happy Diwali, Jay! It must really taste good. Your readers are making comments that make me want to try it. super crispy snacks...love it anytime!! very nice, seems like spaghetti!! Super delicious and lovely one Jay. I love oma podi and my list of things to do for Deepavali keeps on getting added after seeing all these wonderful and tempting posts in blogosphere. 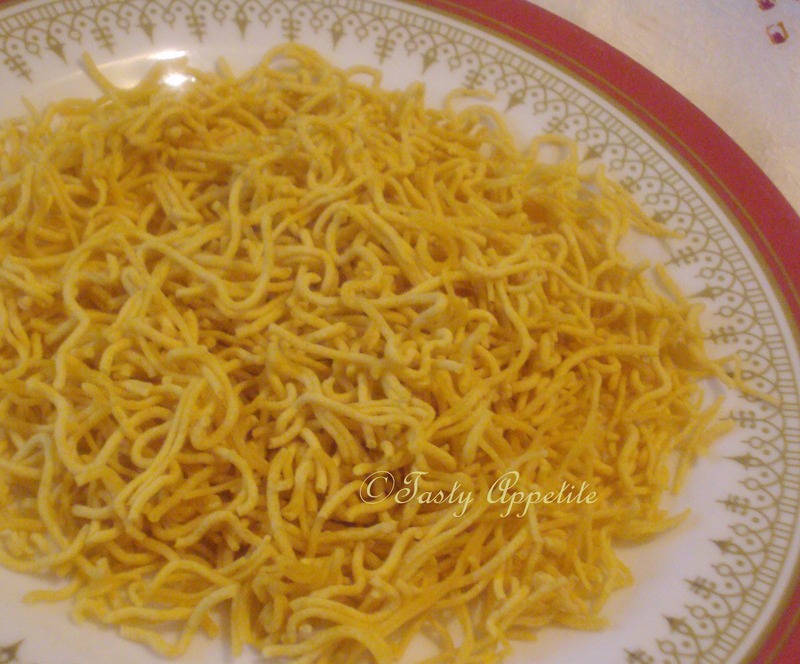 maybe i've eaten this before..it's normally sold by indians at our place, crunchy and a bit salty..very addictive..i'm not too sure if this's the one cos i dont know what they call it. Very nice! Looks very crunchy & delicious. Thanks for sharing. Perfect and tasty! I can almost smell while you're frying them..
sorry for not coming in earlier! am expecting some delish diwali sweets from you...and this one is something you can't stop munching on a rainy day over a cuppa tea!! They look yummy...love anything that is crunchy! 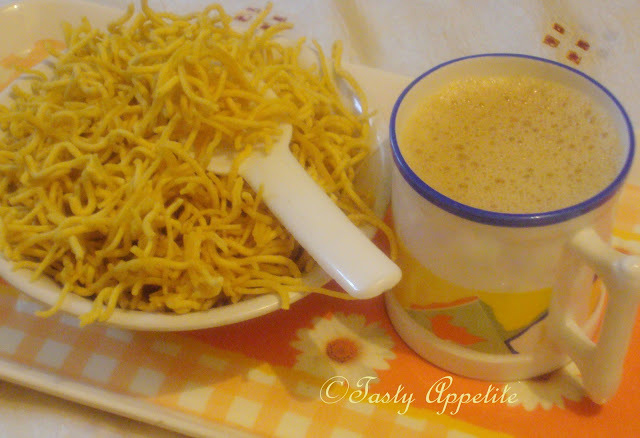 crunchy and yummy snack, perfect with evening coffee..
Yum. I've not had anything like this before, it looks really good. Never heard of omam! Omam or ajwain is a seed and ayurvedic spice available at all Indian stores. This healthy spice helps in lot of digestion. I just love these fried little treats, it looks yummy! 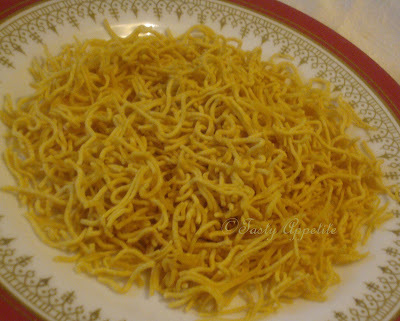 Omapodi looks so crispy and yumm! Looks yummy Jay..can I come over there for Deepavali??? Very nice your blog, id like it very much, this snack sounds wonderfull!! I didn't know about this snack, but It looks delicious! YUM! Need I say more. This looks fantastic and I love the simplicity to it! You've real sweet blog. Btw My first giveawat at my blog. Hope you would like to enter. Thanks for the step by step directions. Makes it so much easy to follow a recipe like this. Oma podi looks great and delicious, just in time for Diwali. Hey Thanks dear for trying my recipe. Omapodi looks yummy. thank you for the step-by-step--i've never made anything like this, but it sounds delightful! 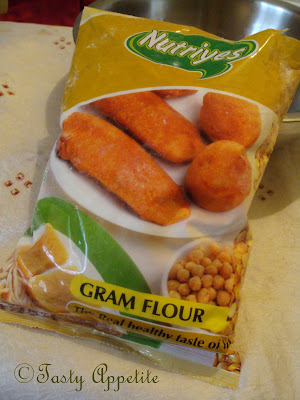 crunchy and yummy snack.one of my fav..